It’s Raining Nightstands! – Uniquely Yours… or Mine! 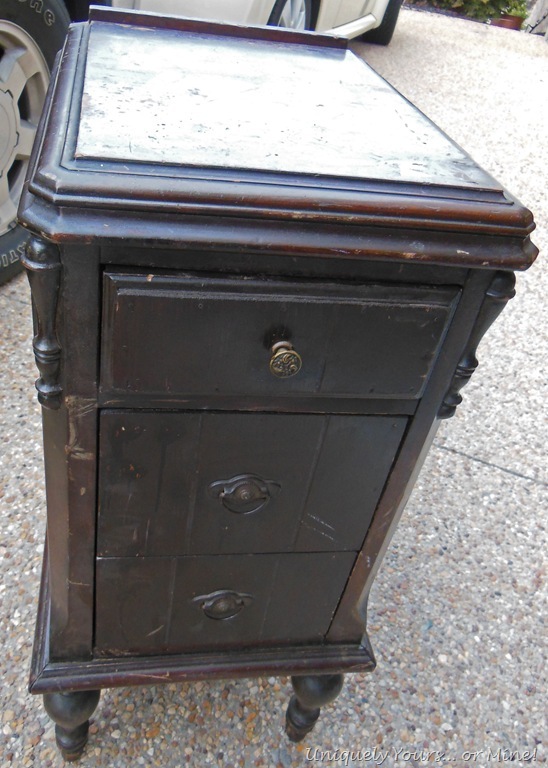 OK… so maybe it’s not really raining nightstands, but I’ve recently picked up a lot of them and I have a few to share with you today! 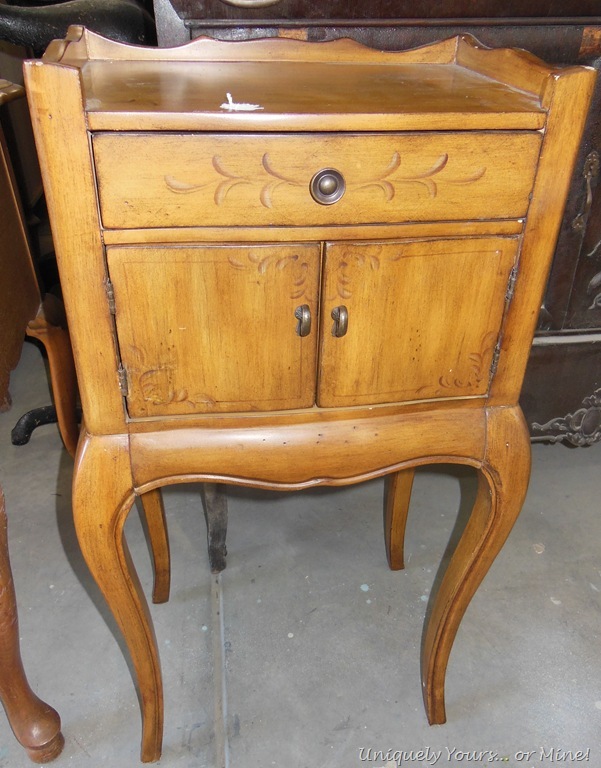 This is one side of a vintage vanity that someone removed from the original piece… it is very old… and I think cool looking. After filling in some holes & sanding it down I painted it in a coat of Aubusson, Annie Sloan Chalk Paint. 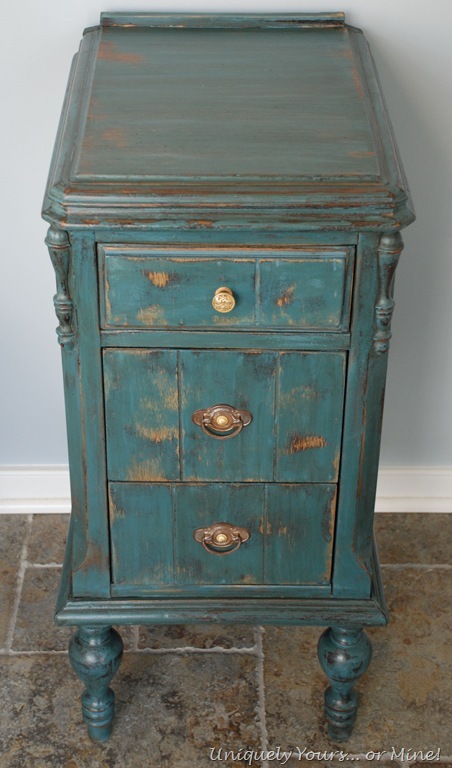 I heavily distressed this piece, I think it really called for it, and sealed it with Annie Sloan clear wax. I soaked the handles in ammonia and water overnight… this is how they turned out… I liked them this way so I didn’t paint them! This is a Pulaski piece, it has a great leggy look going for it and was in pretty good shape. Here it is now! 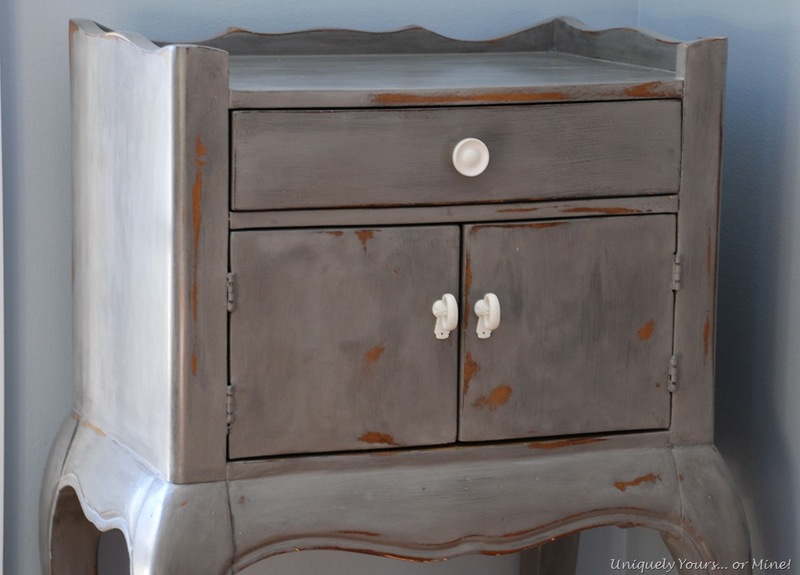 I painted it with CeCe Caldwell’s Pittsburgh Gray, a very beautiful pure gray that I cannot get with mixing the Annie Sloan paints… this will be my new go-to gray for sure! 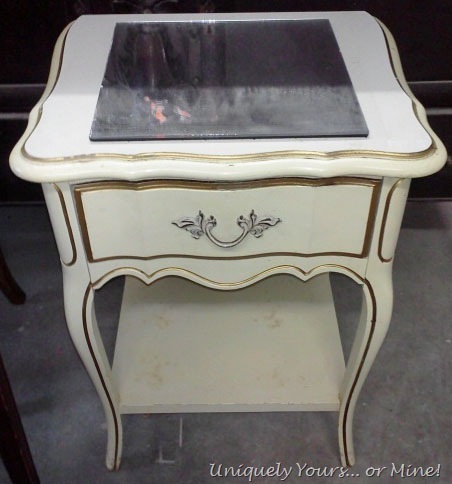 This is you typical “French” style nightstand, it is made by Dixie and is in very good shape… probably circa 1970ish… I thought this mirror was glued on but it was just stuck to the top with what I think was perfume… so strange! 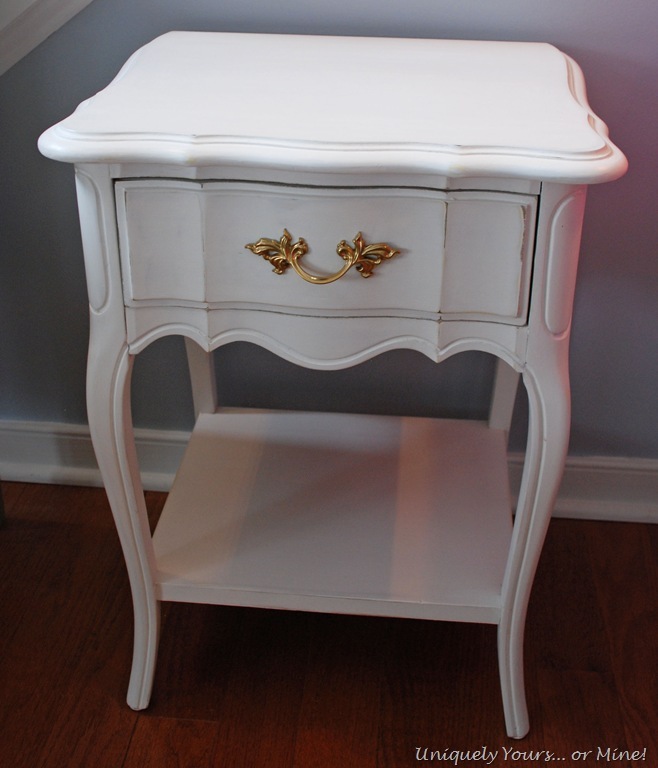 This one just “said” Pure White to me, so that is what I painted it… I had to sand down quite a bit of it so I first sprayed it with a coat of Kilz primer before I painted it with the Pure White Annie Sloan Chalk Paint. 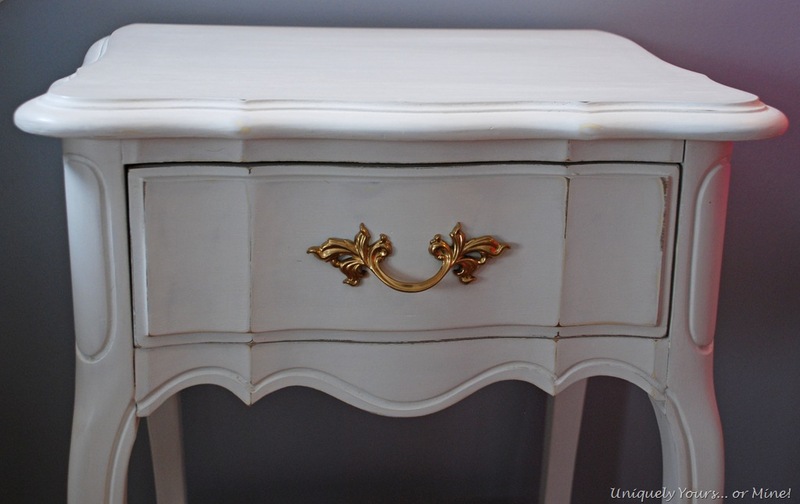 I very lightly distressed it, painted the handle gold and waxed the piece with Annie Sloan clear wax. Nice. Simple.Clean… sometimes that’s just the way to go! I just LOOOVE it so much now! I think it has a nice masculine vibe to it… don’t you? I removed all of the peeling veneer off of the top as well, and stained it Dark Walnut. 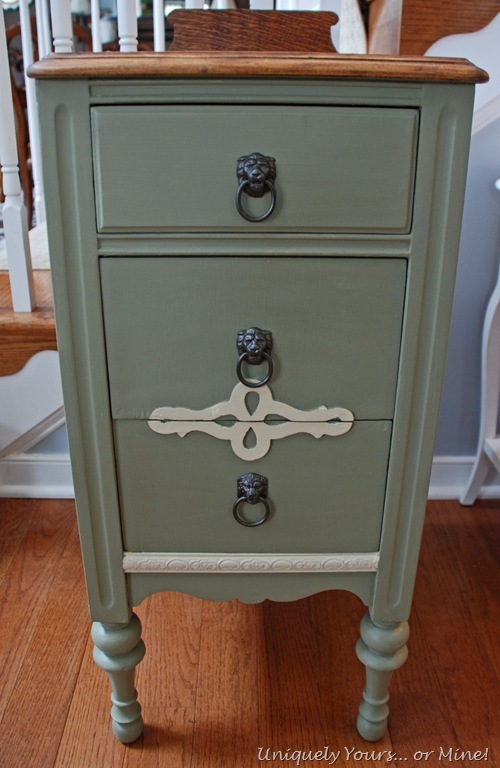 The paint is Annie Sloan Chalk Paint Chateau Grey, which is not grey at all but more of an army green? My Super Awesome Hubby made a new backsplash from some vintage tiger oak we had leftover from another project… did you even notice the original was not symmetrical… I did and it was driving me crazy! The accent pieces are painted with a mix of chalk paints that I called “Bone” and the lions heads pulls are painted a brown metallic. 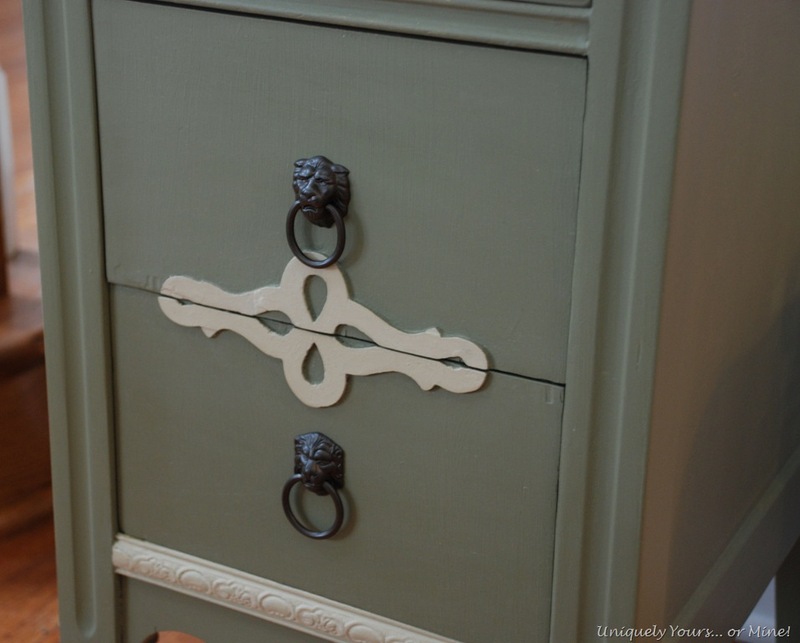 The “original” knobs on this piece were acrylic… so don’t be concerned… I didn’t distress this piece at all and I am totally digging the look! 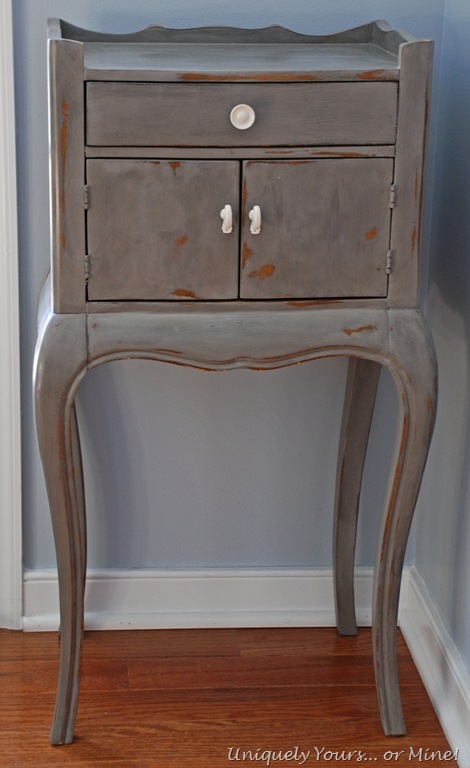 This last nightstand is my favorite of this bunch… I’m not sure why exactly but I really do love it! P.S. 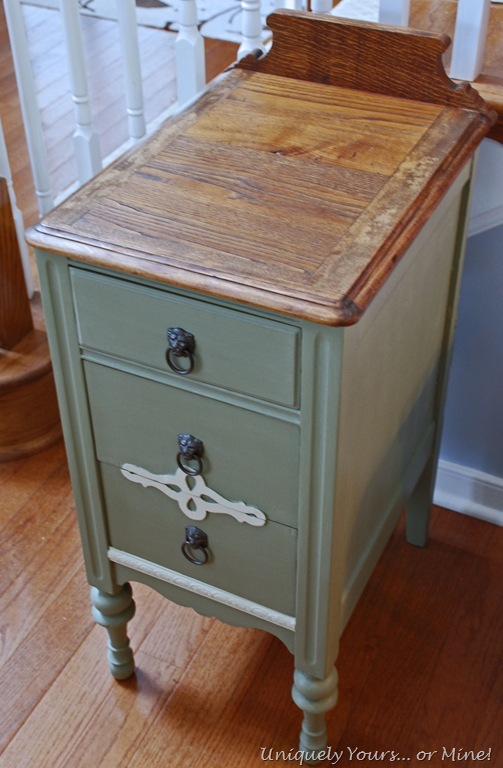 When my Hubby and I were discussing what pieces I should work on next he mentioned a few more nightstands we had, I said “no, we need to work on something else” to which he replied “good, otherwise you’d need to change your business name to ‘One Nightstand'”… Get it? Did I happen to mention that not only is he handy he is the king of corny jokes 🙂 boy do I love that man of mine! All the pieces are so unique. I love what you did to all of them. They all turned out great, but I love the one in Aubusson! You distressed it perfectly. Thanks Deb! Believe it or not that one was the easiest to do… Crazy! Thanks Kathy! 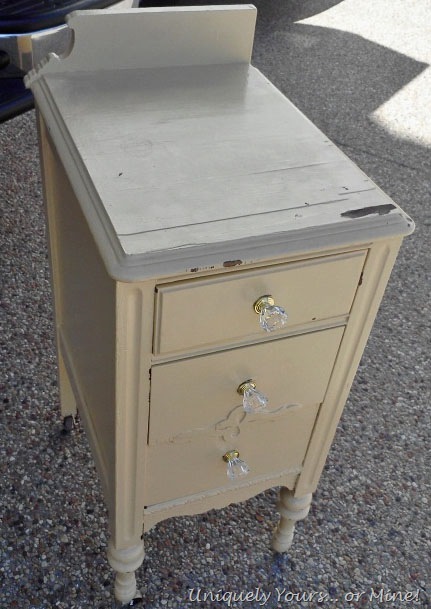 It really has been weird how many nightstands I have found recently… Not sure why?! 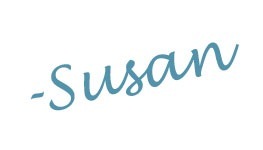 Ah Susan – you’re a hoot and so it your husband! Love your stuff, too! What great finds…the first is my fav!! Wow, you’ve been very busy. All of them look great, but I’m always partial to Paris Grey. These are all great but I absolutely adore that Aubusson stand. 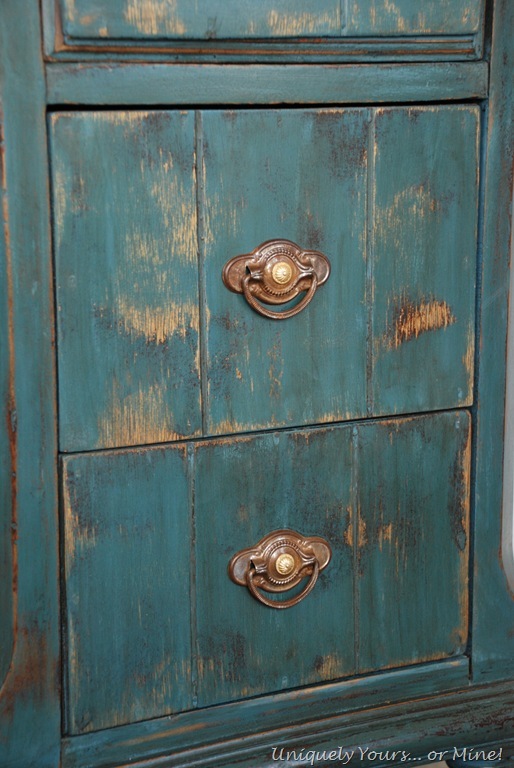 The heavy distressing was a great call! Thanks Denise! I’m glad you like the Aubusson one, apparently my sister did too because she bought it.. Yay! Wow, one pretty piece after another! I wish it would rain furniture at my house! … And Susan, did you know that you are a noreply commentor? I always appreciate your comments and often reply, only to realize once I push send that my reply really doesn’t go anywhere! Thanks so much Sharon! I’ll see what is going on with the comment setting, but I get replies back from other blogs. Let me know if it happens again please as I don’t want to be a no repy commenter for sure! What a beautiful bunch of nightstands! I’m featuring them in the PoPP Spotlight this week. Thanks for linking up. Thank you so much, I’m very excited! Why do you think your Aubusson looks green and mine looks blue? Something wrong with my monitor? I like the last nightstand best. Tres chic. Hi Susan. I recently spent 3 weekends sanding and stripping some very curvey and detailed pieces. What a pain! Can you share more info on the heat gun and technique? The heat gun is Warner but there really isn’t a technique other than wear gloves so you don’t burn yourself! I use a metal scraper with the heat gun, a small one for tight spaces. It us not always easier than stripper but I prefer it.